Confidence in my own design process. My degree was in “Textile Design” at what was then The Scottish College Of Textiles and is now Heriot Watt University in the Borders. I worked with screen print and then went on to specialise in woven fabric design for my final year. Although the medium is not completely relevant to what I am doing now the “design” training was fabulous. During my third year we were lucky enough to spend a week working on a design brief with guest lecturer Kaffe Fassett. Even luckier to be invited to visit his flat and “talk textiles” when we were on a college trip to London back in 1981. Latest favourite tool / piece of equipment or fabric choice. The music or radio you work to. I always have the radio on in my studio. I go through phases between Radio 2 and Radio 4. The line in a song you wish you’d written. “And there’s you, a little black cloud in a dress” Billy Bragg Must I Paint You A Picture. 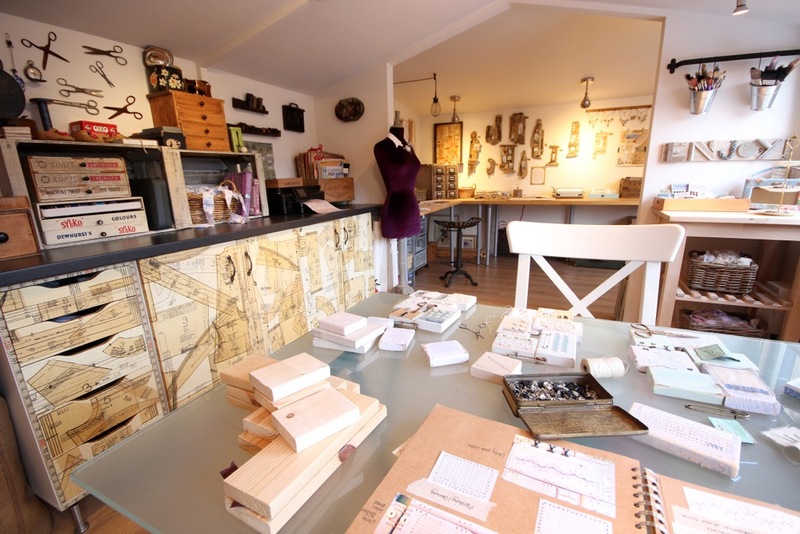 The Purple Thread Shed – my very lovely workshop at the bottom of my garden. My husband built it for me a few years ago and then last year we extended it. It truly is my happy spot! I was taught to knit and sew at an early age and then at secondary school I had two wonderful female art teachers who really encouraged my interest in textiles. I married two weeks after graduating and started my family aged 23, so I started my own knitwear business, which I ran from home for many years. As my family grew older I decided to take a complete change of direction and started working creatively with family support projects in the community. About seven years ago I had a strong desire to get back into textiles and to be around like-minded people so I did my City & Guild at Edinburgh’s Telford College. This completed the circle for me as I was able to bring together my love of stitching with my design background. Good to hear Ali’s views and influences. Am seriously impressed by and envious of her studio space. She obviously regards it as a large part of her life. What I need to know is how do people allow/find the time to be able to treat their textile work with a seriousness that results in a body of work, and the space to move forward. My life is so very full of (mainly other people’s) needs that I can only work in very unsatisfying, snatched moments. I have competing ideas swirling round in my head but no time to go further with them until an impending exhibition kicks me into action. I would love the hear the thoughts of other edge members.